Picture of Crax genus of Curassow. Picture of Curassow (Mitu genus) The Curassow is the ordinary corruption of Curacoa-bird, as the name was spelt in 1756 by Browne (Civil and Natural History of Jamaica, page 470), and doubtless due to the belief that the birds of this kind which were first known to English voyagers came from the island so called. Dampier, a good authority on many things although not on orthography, in 1699 and 1703 used Coresso and Curreso (Voy. ii part 2, page 67, and iii part 1, page 74); Albin in 1738 wrote (N. H. Birds, ii page 29) of birds of this kind (he having drawn illustrations of both male and female), "They are generally brought from Carassow, from whence they take their name." Sloane in 1707 (Voy. page 302) used Quirizao for both island and bird; and Linnaeus in 1758 (Syst. Nat. ed. 10, i page 157) used Gallus curassivicus, which he professedly got from Aldrovandus. 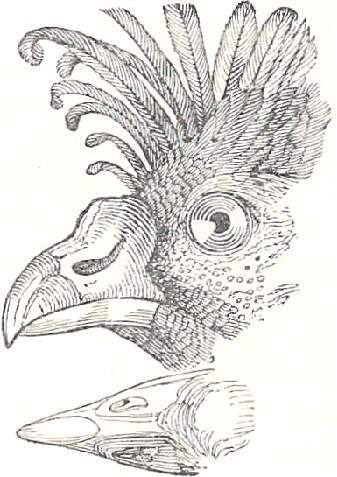 He illustrated a species of Crax as Gallus Indicus (lib. xiv cap. 10). The Curassows are the Cracinae subfamily within the Cracidae family of birds (the only other subfamily within the Cracidae family is the Penelopinae (chacalacas and guans)). Within this Cracinae subfamily four genera were recognized by 19th Century naturalists, Professor Huxley and Mr Salvin, and these 4 genera are still recognised today. 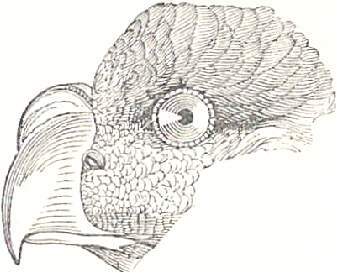 The first of these is Crax with a soft cere, and the nostrils placed in the middle of the maxilla, while the remaining three have the whole of the bill horny and the nostrils at its base, the lores being bare in Nothocrax, but feathered in Pauxis (Cashew Bird) and Mitu (previously known as Mitua),the former of which bears the curious frontal knob already mentioned, while the latter has the culmen of its short and greatly compressed bill elevated and swollen. Overall within these 4 genera there are a total of 14 species of Curassow. The Cracidae are one of the most characteristic families of the Neotropical Region, outside of which but few of them and none of the Cracinae go, and are especially abundant in Central and the north parts of South America, with a few being found in Paraguay. The Curassow is similar in appearance to a turkey. They have colourful ornamentation on the head. However, unlike turkeys, Curassows build their nest in trees as they are arboreal birds. Generally 2 or 3 eggs are laid, which the female incubates for around 28 to 32 days. They will come to the ground to forage for food. Their diet includes fruits, seeds and berries as well as insects and small animals. These birds thrive well in confinement. Their size and temperment mean that they can be aggressive and dangerous though. They are particularly defenceful when guarding newly hatched chicks.